First and foremost, a huge shout out to my wonderful friend Abby (@ Bodging for Apples II) for sharing her resources about her castle camp that she planned and taught last winter vacation. 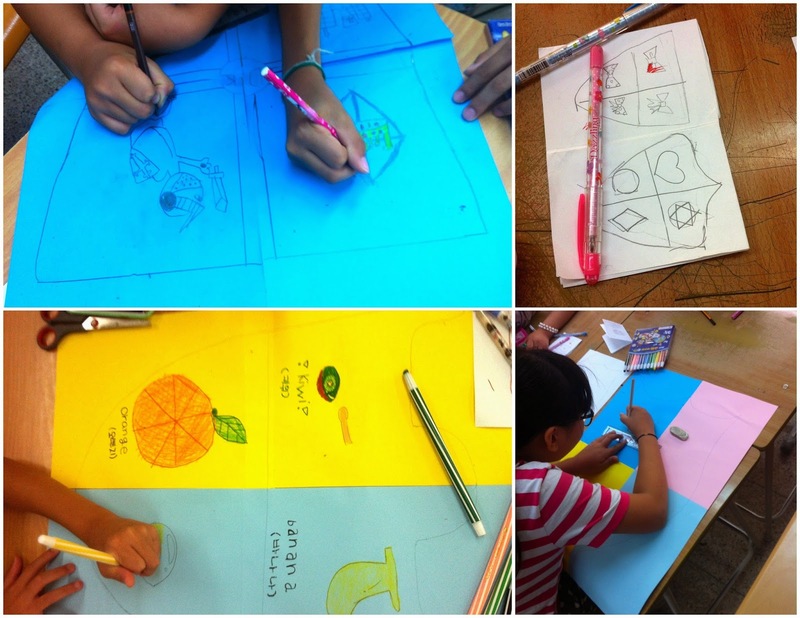 Today I finished the first week of summer English camp, so here's a quick summary of what we did each day. I list a brief outline of that day's plan, and then share comments about how it actually went. Just like with my winter "It's a Small World" English camp, you can purchase the entire 2-weeks of detailed lesson plans, PowerPoints, handouts, materials budget spreadsheet—all of it—for less than a hot plate of kimchi bokkeumbap! Sing: Learn the Knights and Dragons song, which is sung at the start and end of each class during the week. Explain castle points, which all teams can earn throughout camp this week. 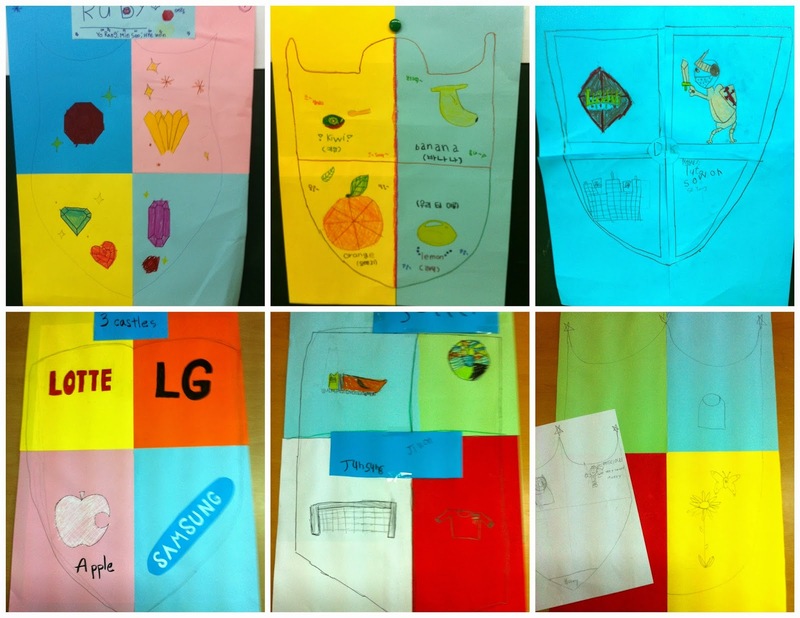 Make: Each group chooses a team name, and then makes a family (team) shield. Day 1 comments: I knew right away with the younger class that there were way too many words in this song for them to actually learn all the words. So I only taught the first three sentences of each verse, as they're quite similar to one another ("I'm a ~. As you can see. I have a ~ and a ~ on me."). I did the same with the older class, as there are still tons of words in the whole song. 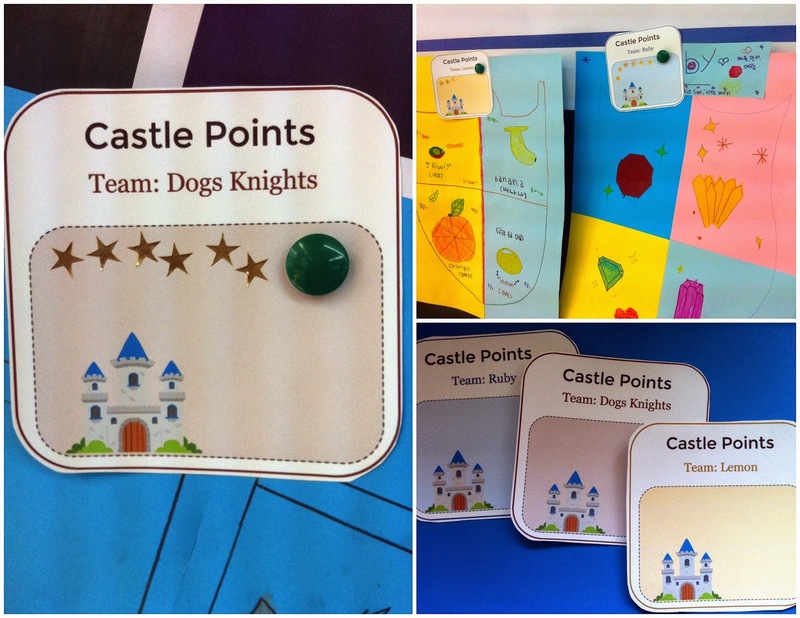 After class I made quick little Castle Points cards for each team, now that teams were formed and had names. It's been so awesome having access to a color printer these past few months! For the rest of the week I'd put each class's shields and castle points cards up on the board with a magnet before class started, and leave them up during the hour and a half. 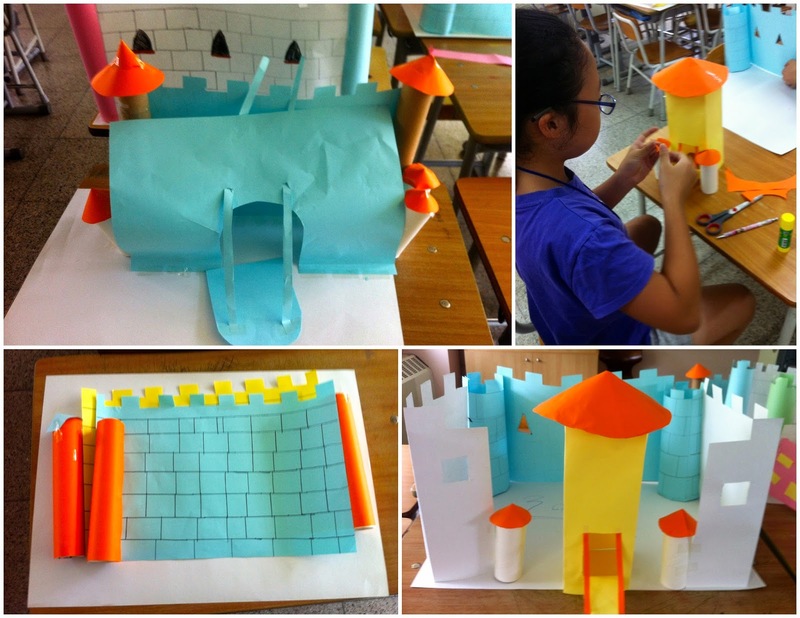 Make: Each team makes a castle using primarily paper, scissors, and tape/glue. 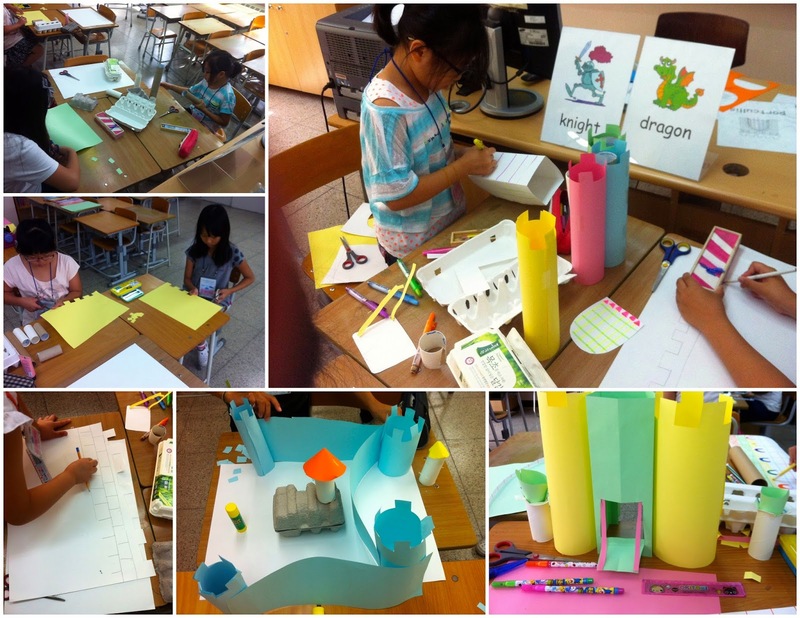 Day 2 comments: I had made two separate PPTs for 3rd/4th and 5th/6th to introduce parts of a castle. In the 3rd/4th PPT I used tower, moat, drawbridge, arrow slits, gate, and battlements. In the 5th/6th I used portcullis (instead of "gate") and keep (instead of "tower"). The quiz format might have been the biggest difference, as in the 3rd/4th PPT I'd often read a word and they had to choose the right picture. Well, I forgot to change the PPT when my 5th/6th class started, but I think the other one probably would have been too hard for them anyway. The younger kids were a lot more excited to start building castles than the older group, though I think it could have more to do with the mix of students than the age difference. Most didn't completely finish, but that was perfect because when kids came in early (some girls in the first class came a half hour early every day this week) or if we had some extra time, they could work on their castles. 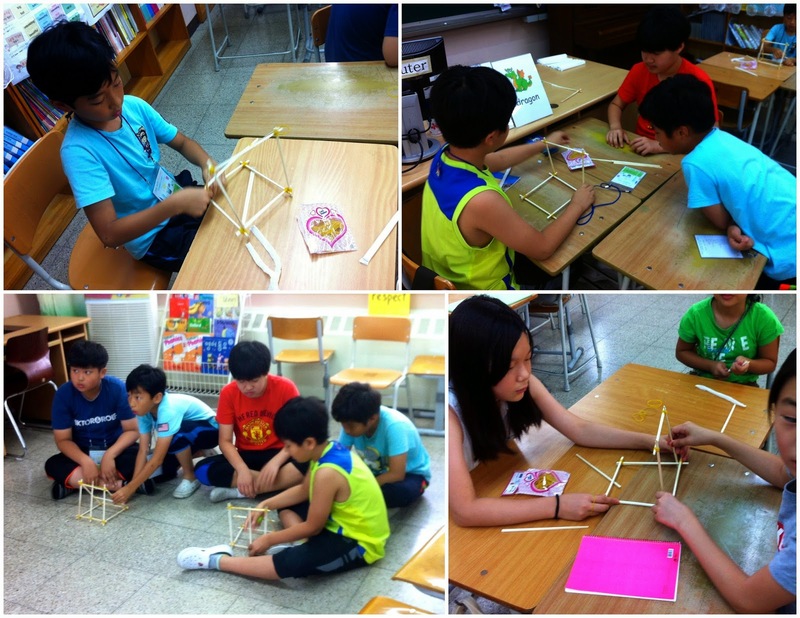 Make: Each team makes a catapult using wooden chopsticks and rubber bands. Competition: Teams compete with their catapult in three categories: highest, longest, and most accurate (try to knock down paper cups). Winners of each category get two castle points. Day 3 comments: I based today's short PPT off of an existing catapult PPT, and I'm really glad it included a Lord of the Rings clip, and a human catapult video clip. Those were fun for the kids to watch. I don't know what I was thinking, but in an effort not to put any more time/effort into camp than I already had, I didn't make a catapult myself ahead of time. I got a little worried at one point when the younger kids couldn't get certain pieces together - because I wasn't sure how to do it either - but that only lasted a few seconds. A little fooling around with their chopsticks and rubber bands, and I quickly figured out best ways to attach different parts together. A few were less enthused with the endeavor and thought it was difficult, but everyone really enjoy themselves once they were launching bottle caps from their finished catapults. I really liked this activity! 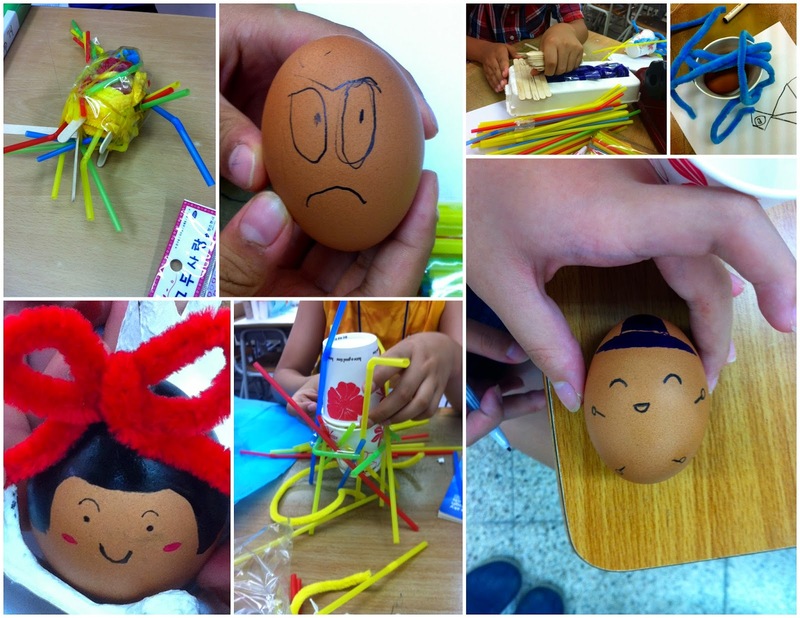 Make: Each team decorates an egg as a princess, and then constructs an "egg seat" to protect the princess from a fall. Competition: Take the "princesses" outside for the egg drop. Record what happens to each egg. Day 4 comments: Everyone seemed to enjoy the warm up today. It's a very simple game with no materials. You find a partner and on the count of three you each show a certain number of fingers with one hand (you choose how many fingers to put up). The first person to say the total number of fingers (in English) wins. So, if you hold up two and your partner holds up three, the first person to say "five" wins. After practicing with different partners I had everyone return to their seats and we played "around the world" style - basically a class competition to see who could beat the most number of students. I liked doing the egg drop too. 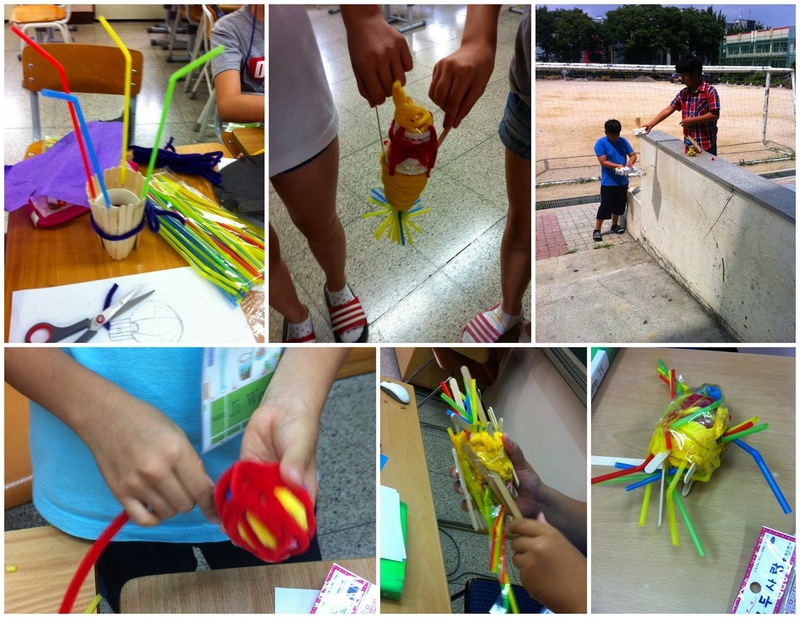 We had popsicle sticks, straws, pipe cleaners, tape, and some crepe paper to work with. During the second class I was getting bored watching the minutes slowly tick by while groups had about an hour to work. So then I decided to make one too, since there were two eggs left in the fridge! I hard boiled the eggs the night before, which is highly recommended. 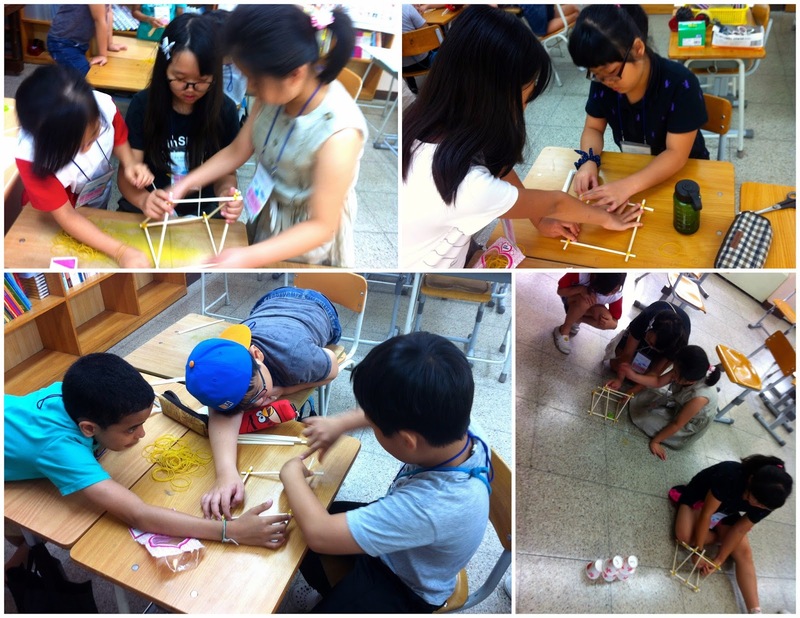 One group dropped and cracked theirs before they even started constructing anything. Sing: Frozen sing along to In Summer. Winners: Announce castle point winners, and let them choose a prize first. Day 5 comments: The human knot activity was a big hit during winter camp (the kids played over and over), but this batch of kids didn't see the appeal. The younger class didn't finish untangling their first human knot, as all of a sudden many kids just let go. I had to do some coaxing to get them to try it a second time. 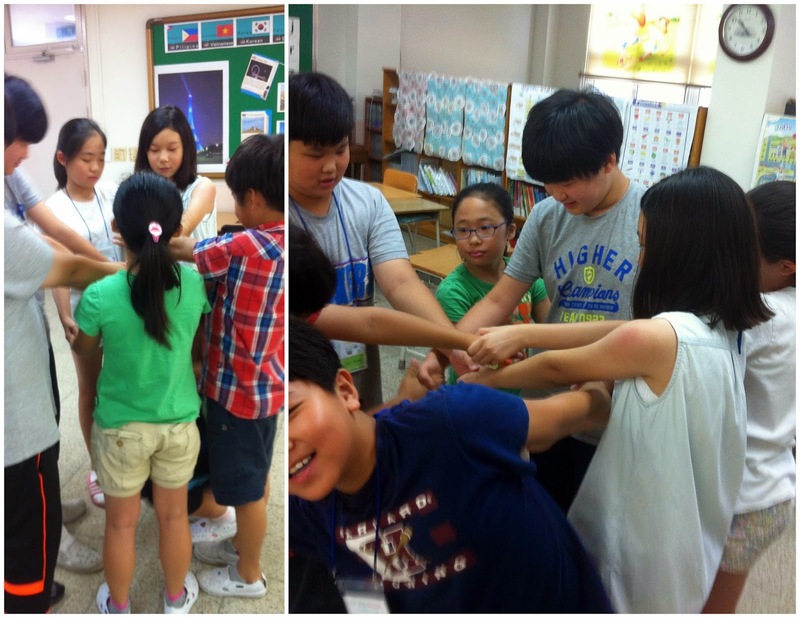 The older class untangled themselves much easier than the younger kids, but they all sat down after solving it once. Again, it took a bit for me to get them to come back from their desks and try it again. I played with them the second time. There was no Frozen sing along, as after the Angry Birds game I did prizes right away, and there wasn't that much time left in class. With the younger kids I let them just play around with their prizes, and then I took pictures of each group with their castles and shields before they took them home (or dumped them in recycling). The older kids had more time left, so we briefly played the touch-and-go game with royal family words and a few castle parts. Again, they didn't want to keep playing after just three quick rounds (~5 minutes), so strange. There were still ten minutes left of class so I turned on some music and just started cleaning. A few followed suit and helped out. Then all of a sudden kids just started saying bye and leaving, but there were only five minutes left at this point so I just went with it. Overall, castle camp was a success! It definitely had a different vibe from winter camp, greatly due to the combination of students. I hope detective/mystery camp goes well next week, though am worried activities won't take as long as I'd planned. Time will tell! 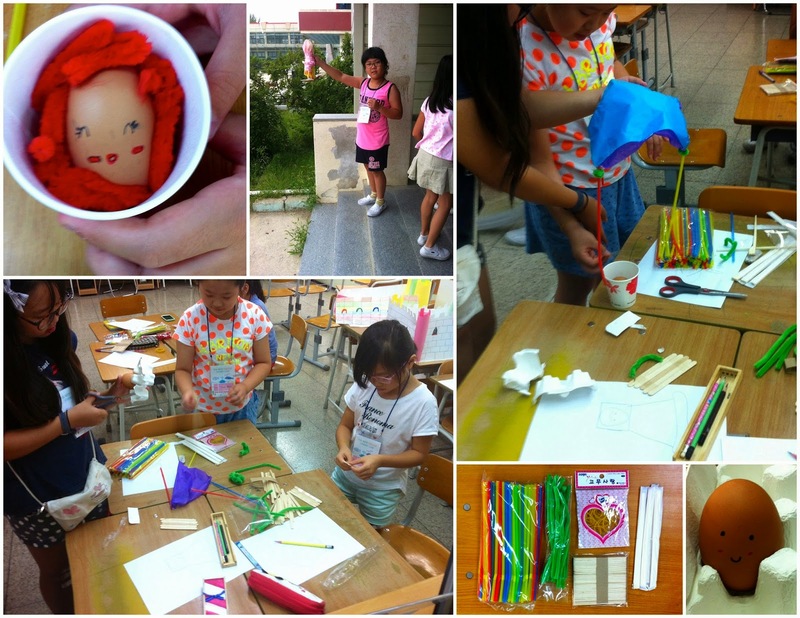 Update: Here's the second week of our Royal Mystery camp!